5 Ways to Get IRS Help on Tax Issues ? 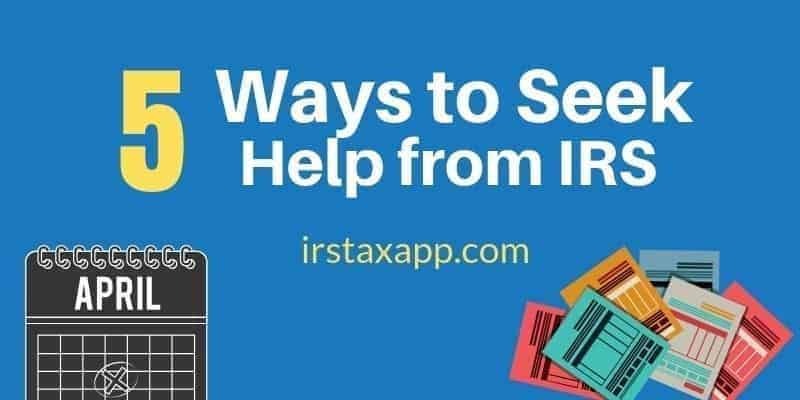 One of the best ways to get information on any federal tax issue is to visit IRS website which not only provides easy to find answers to your most commonly asked questions on various tax matters, you can also download virtually any form or help publication in pdf format from the website. Thus, the IRS website provides 24×7 tax help by providing a tremendous amount of information right at your fingertips, including frequently asked questions, tax law changes and even tax calculators. If you want to do traditional correspondence via snail mail, you can do so writing to the director for your local IRS district or your local taxpayer assistance centre. As a general rule, You must allow 30 days for a response. The IRS has local offices, known as taxpayer assistance centers, where you can go to ask questions and get service. How do you find the nearest local taxpayer assistance centre? Visit IRS Local Office Locator and put your Zipcode, the online site will give you the irs tax help near me address of your local taxpayer assistance centre. PLease note that some centres works by appointment only , while others offer walk-in service. The online search will provide every details like phone number , hours of office , map guide etc. In an era of internet , FAX is still one of the tool for IRS help ! Yes you can seek IRS forms or instructions directly via fax. Use your fax machine to call the IRS TaxFax service at 703-368-9694. After following the instructions, the forms you requested will be faxed to you. How Long Do You Have to Keep Tax Records ? How to Get Tax Return Transcript from IRS ?